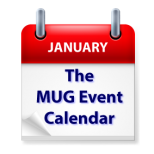 This week’s MUG Event Calendar has two software publishers presenting to MUGs on two different sides of the U.S. Smile will be the featured at a Connecticut group, while Microsoft will visit a California group. A Florida group will look at macOS Mojave, and cautions about your online activities are on the agenda at an Australian group.